I'm Shirley Griffith. And I'm Steve Ember with the VOA Special English program PEOPLE IN AMERICA. Every week we tell about a person who was important in the history of the United States. Today, we tell about Anne Morrow Lindbergh.She was a famous pilot and writer. Anne Spencer Morrow was born in nineteen-oh-six in Englewood, New Jersey. Her father was a very rich banker. He later became the American ambassador to Mexico. Her mother was an educator and poet. Anne went to Smith College in Northampton, Massachusetts. She wanted to become a writer. She won two major prizes from the college for her writing. 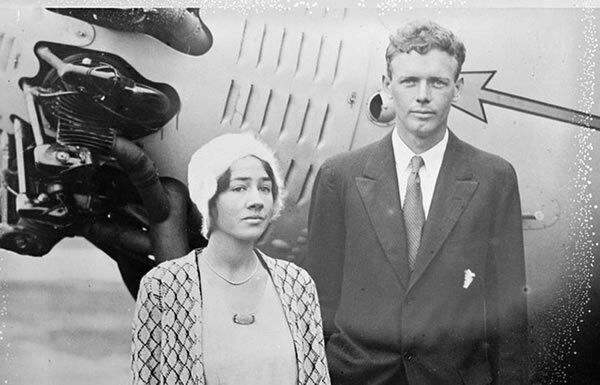 Anne Morrow was a quiet, shy and small young woman when she met Charles Lindbergh in nineteen twenty-seven.He was staying with her family in Mexico City. The twenty-five year old man was tall and good looking. Charles Lindbergh was one of the most famous people in the world. He had just become the first person to fly a plane alone across the Atlantic Ocean, from New York to Paris. Two years later, Anne and Charles Lindbergh were married. Reports about their marriage were on the front pages of newspapers around the world. After her marriage to Charles Lindbergh, Anne became a pilot. She learned to plan an airplane flight as a navigator, operate a radio and fly a plane.She began making many long airplane flights with her husband. In nineteen thirty, she became the first woman in the United States to get a pilot's license to fly a glider, which does not have an engine. That same year, the Lindberghs set a speed record for flying across the United States.They flew from Los Angeles, California to New York City in fourteen hours and forty-five minutes. Anne Lindbergh was seven months pregnant at the time. The Lindberghs explored new ways to fly around the world. They flew almost fifty thousand kilometers over five continents. Anne and Charles Lindbergh were famous around the world. They seemed to enjoy the greatest luck that any young people could have. Then in nineteen thirty-two something terrible happened. The Lindbergh's first baby, twenty-month-old Charles, was kidnapped from their home in New Jersey. The body of the baby was discovered more than ten weeks later. Bruno Richard Hauptmann was arrested, tried, found guilty and executed for the crime. There were a huge number of press reports about the case. Newspapers called it "the Crime of the Century." After the trial, the Lindberghs found it difficult to live in the United States. There were threats on the life of their second child. And there were too many newspaper stories about them. So Anne and Charles Lindbergh moved to Europe in nineteen thirty-five. Four years later they moved back to the United States. Anne Morrow Lindbergh never fully recovered from the death of her first child. Yet, she and her husband had five more children.She continued flying. In nineteen thirty-four, she became the first woman to win the National Geographic Society's Hubbard Gold Medal. She was honored for her exploration, research and discovery. Anne Lindbergh began writing to ease her sadness. She wrote several books about the flights with her husband. Her first book was "North to the Orient" in nineteen thirty-five.She wrote about their flight in a single-engine airplane over Canada and Alaska to Japan and China. This is what she wrote about landing in northern Canada and jumping out of the plane. "Then two little Eskimo boys came up shyly and followed me about. Their bright eyes shone under their caps as they searched my face and costume curiously. 'You see,' said one of the traders, 'You're the first white woman they've ever seen. There's never been one here before.' "Three years later Anne Lindbergh wrote "Listen! The Wind." It was about the Lindberghs' fifty thousand kilometer flight. It became very popular. One critic said it described the poetry of flight as no other book on flying had ever done. In nineteen forty, Anne Lindbergh wrote a book called "The Wave of the Future. "She wrote it while Europe was fighting World War Two. She wrote that she did not support communism or fascism. But she said they were unavoidable. She wrote that she hoped the United States could avoid entering the conflict. And, in a letter, she wrote that she was beginning to feel that the German Nazi dictator Adolf Hitler was a very great man.Her husband had become unpopular for expressing similar beliefs. Many people criticized the book. Missus Lindbergh later admitted that both she and her husband failed to see the worst evils of the Nazi system. She stopped writing for many years. Anne Morrow Lindbergh began writing again in nineteen fifty-five. She wrote a book called "Gift from the Sea." It was about women's search for meaning in their lives. "Gift from the Sea" was one of the most popular books in America. It has sold more than one million copies and has influenced many women.In "Gift from the Sea", Missus Lindbergh wrote about the many different kinds of pressures that women face. She wrote that women who are wives and mothers have many different interests and duties. They must be able to deal with their husband, children, friends, home and community. She found it difficult for women to balance all these duties and still make a place for themselves. Yet she said that women must try to find a balance in their lives. In "Gift from the Sea," Anne Lindbergh described how women had to perform many jobs that pulled them in different directions like a circus performer. "What circus act we women perform every day of our lives. It puts the trapeze artist to shame. Look at us.We run a tight rope daily, balancing a pile of books on the head. Baby-carriage, parasol, kitchen chair, still under control. Steady now!This is not the life of simplicity but the life of multiplicity that the wise men warn us of. It leads not to unification but to fragmentation.It does not bring grace; it destroys the soul." Anne Lindbergh found that one answer to this problem was to be alone. The book described how she spent time by herself on an island by the sea.She studied the sea shells she found. And she made her life simpler. During the nineteen seventies, Anne Lindbergh wrote several more books about the happy and sad events of her life.One of these is called "Hour of Gold, Hour of Lead." She wrote about the joy of flying. She also wrote about the pain she and her husband felt after the body of their baby son was discovered. "We sleep badly and wake up and talk. I dreamed right along as I was thinking – all of one piece, no relief. I was walking down a suburban street seeing other people's children and I stopped to see one in a carriage and I thought it was a sweet child, but I was looking for my child in his face. And I realized, in the dream, that I would do that forever." Charles Lindbergh died in nineteen seventy-four at the age of seventy-two. The next year, the readers of Good Housekeeping magazine voted Anne Morrow Lindbergh one of the ten women in the world they liked the most.In nineteen ninety-six, Missus Lindbergh was invited to join the National Women's Hall of Fame. She was honored for her success as a pilot. Anne Morrow Lindbergh died at her home in Vermont in two thousand one. She was ninety-four years old. Many people have been influenced by the way she dealt with both happiness and sadness. They respect the way she lived life to the fullest. And they like the advice about living that they find in her books. "If you surrender completely to the moments as they pass, you live more richly in those moments."